The beta 10 is out! - It fixes the bug on transparent textures mentioned by db4tech (note that the fix will let transparent textures appear clearer). - To reduce Photo and Video creation dialog height and improve their quite weird layout, I replaced quality info labels by tooltips with a special behavior: the tooltip appears when you roll over the quality slider and also when you click on it. - Changed the color of the Sun light depending on the hour of the day. - Used Silk rendering / Uber shader at best quality rendering along with a light ambient occlusion effect to avoid dark zones when they don't receive sun light. - At the 3rd quality level and in Aerial view mode, shiny surfaces are computed with SunFlow shiny shader that lets appear a reflect (as in Beta 9). It's less nice but much faster to compute. - At the best quality level in Virtual visit mode, shiny surfaces are computed with SunFlow Uber shader that gives a silk effect, and ambient occlusion is always on to avoid very dark shadows. - In Aerial view mode, the texture applied to the sky is never used, because I find the shadow effect computed with sun sky gives really nice results (this was the behavior of Sweet Home 3D version 2.6, but not in previous beta versions). 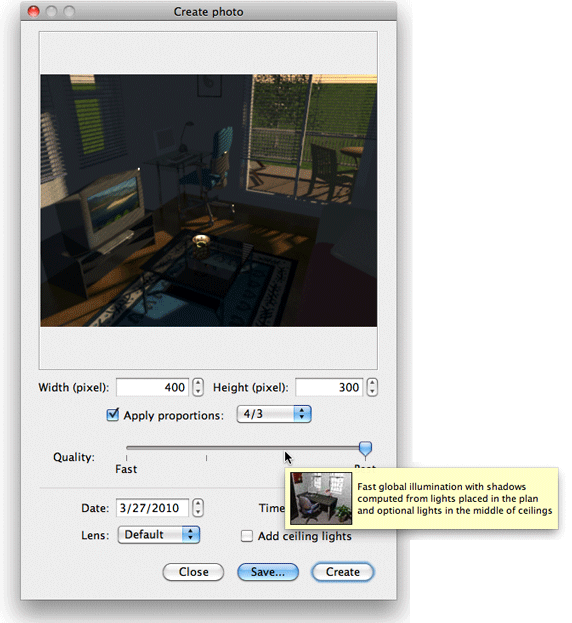 If this really annoys you or if you really want silk effect or prefer ambient occlusion (which is nevertheless very dark), you can still elevate the user's point of view in Virtual visit mode at a location similar to Aerial view mode. I hope these behaviors aren't too complicated. If you just oppose 3rd to 4th quality, and Aerial view to Virtual visit modes, they should feel quite logical and (almost) intuitive for beginners. In a way, there isn't much difference with version 2.6, except that best quality is better and most consistent (at best quality level, ambient occlusion is always on and gives the same shadows whether you apply a texture to the sky or not). During the night, there's no sun (I don't mean it's hidden, I mean the sun and the sky are not computed at all), so changing time from sunset to sunrise won't change anything. I don't see much difference in the two images you show, anti aliasing apart. Matte or glossy option for walls is really interesting. Is it possible to integrate it on the furniture? This option should appear in a coming beta. I just hope that the furniture modification dialog won't get too complicated (no I don't want to add some tabs at this moment ). Another topic. Is it possible to lock the base plane, which prevents accidental mishandling while leaving the possibility of having access to the parameters of a wall or object, without needing to unlock? Even if it's easy to program, I'd rather not. Locking the base base plan must remain simple on a selection point of view.